Welding and clamping tables by Siegmund stand for highest functionality and exclusive design. 30 years ago today’s CEO Bernd Siegmund (graduate engineer) developed with his engineering office constructions, transport systems and machines for the automotive and environment technology. Today they are a global leading company. Selling Europe-wide and have a distribution network of over 50 countries. Producing welding and clamping tables and machines and machine parts. 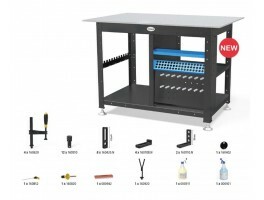 They captured a place as world market leader in the market segment "precision welding tables". Siegmund products are used in nearly all branches, especially at machine-, construction-, metal- and automotive technology. It is applied at the prototype construction as well as at the series production with and without robot connection. With their welding and clamping tables it is possible to actualize extensive application and combination possibilities within a short time due to the elaborate building blocks system with a huge variety of compatible clamping tools. Siegmund's strength is the competence and the huge engagement of thier employees. Even at the most challenging demands of the customer they succeed in giving the trend-setting solutions.